Nasturtiums are always present in my cool-season vegetable garden. I enjoy taking a stroll in my back garden in the morning before getting to work. It helps me to start the day with a feeling of peace as I stop to admire a new flower or the vibrant greens creating lovely contrasts of color with the more gray/greens of my flowering shrubs. Today’s post is all about you. There are two things that I have been asked to do by several of you. First and foremost, I receive a lot of gardening questions via my inbox and my Facebook page, which I do my best to answer. Several of you have asked me to do a Q & A session where I take questions and provide answers. So, I am asking you if any of you would be interested in this. It would be done through Facebook Live, where you can view it ‘live’ at a preset day and time and I’ll answer your answers in real time. If you can’t watch it live, you can watch it when it suits you. *If you cannot watch it live, you can send me your questions ahead of time and I’ll answer them during the session. Would any of you be interested in this? If so, please let me know in the comments section and if enough people express interest, I will schedule a live Q & A session. The second item that I’d like to address are the requests to see more of my garden. I’ve hesitated to do this in the past, other than glimpses here and there, as my garden isn’t perfect. But, then I realized that ‘perfect’ gardens can inspire stress in those that view them as they feel pressure to emulate that perfection, which in all reality, probably takes a lot of work from landscape professionals. So, I have decided to create a video of my entire garden, which is a work in progress but should be posted later this week. I’d love to hear your thoughts on both of these things. I hope your week is off to a great start! While spring break is a time where masses of people escape the cold for warmer climates (like Arizona), we decided to do the exact opposite. We flew out of warm, sunny Phoenix and headed to cold and snowy Michigan. Now before you start to question my sanity, I have an excellent reason for bundling up and bracing myself for the cold, windy weather. My daughter and her family call Michigan their home now, and since then, we try to make it out at least twice a year, and spring break just happened to be the best time to do it. I always look forward to visits to their town of Petoskey, which sits on the shore of Little Traverse Bay. It is a popular summer destination, and I spent several weeks here last year helping my daughter move into her new house and add new plants to her garden. It is always fun pulling out my warm weather gear, which seldom gets used at home. I knit these fingerless mittens a few years ago and rarely have a chance to wear them. As a Southern California native and Arizona resident, I must admit that I have relatively little experience with cold weather so, it has been fun exploring the landscape and seeing the effects of winter. Seeing the bay frozen in time where we waded in with our feet last June was exciting. At the beginning of our week, the temperatures were in the mid 20’s with a brisk wind, and we were excited to see an unexpected snow shower. I realize that many of you who have lived in areas with cold winters may be rolling your eyes at this point, but for someone who has always lived where winters are mild, the weather has been a novelty. However, the novelty quickly wore off this morning when I stepped outside, and it was a frigid 16 degrees, and I learned why people start their cars a few minutes before they get in to let them heat up inside. But, I braved the few steps from the house to the car, and we were off to my granddaughter Lily’s preschool class where I was to give a presentation on the desert and Arizona. I was struck by how different the desert is from the Michigan landscape and felt honored to expand their horizons. On the way back from pre-school, we were tasked with bringing the classroom pet, ‘Snowball’ the guinea pig home where he will stay with Lily for spring break. Doing little tasks such as this bring back happy memories of when our kids were little. We will be home soon, and spring is a busy time for me. I have new plants coming in the mail (straight from the grower) for me to test in my Arizona garden, I’ll be showcasing two new plants from the folks at Monrovia, and in a couple of weeks, I’ll be traveling again – this time to Savannah, Georgia for a fun project that I’m excited to share with you soon. *What are you doing for spring break? I have a problem in my garden. The suspects who wreak havoc on my vegetable gardens are furry, have tails and whiskers. On the surface, they are very cute, but wild on the inside and shy away from contact with humans, except for the neighbor who feeds them. Now before we go further, I must tell you that I like cats – a lot. I don’t mind them in my backyard and enjoy watching them stretch out in the sun on a winter’s day or enjoying the filtered shade from my trees in summer. What I don’t like is that they use my raised vegetable beds as a litter box. To help deter them, I added a motion control sensor that is attached to my hose, which sprays anything that gets too close to the garden (including me if I forget to turn it off before working in the garden). This has helped, but there is still half of the garden that the cats continue to use as a toilet. Not a place I want to grow vegetables. I had done research on plants that may repel cats, and the herb ‘rue’ (Ruta graveolens) kept coming up. The problem was, I had a hard time finding it as it’s an old-fashioned herb, and isn’t used much anymore. Nursery visits have become more frequent for me lately as I am preparing for a visit from a magazine and a wedding that will be held in out backyard. So, I’ve been giving my garden a little more attention, and that means plant shopping! While I was browsing through the aisles at the nursery, I spotted a tray filled with rue plants. I must admit that I could hardly contain my delight and bought seven without a second thought. Of course, I also came home with several other plants for the garden too. I was so thrilled to have found some rue and have a chance to see if it would keep the cats out of the garden. The dried leaves from rue are also purported to keep cats away, so I can harvest the leaves and use them in other areas if I need to. The plant itself is attractive with lacy foliage, and the leaves smell just fine to me – cats just don’t like it – hopefully. I am somewhat hopeful that this will do the trick, but I am also a bit cautious as not all surefire solutions work. I’ll be sure to let you know if it works to keep the cats out of the vegetable garden. **Have you ever had a problem with cats in your garden? What did you do to get rid of them? Summer is a season filled with warm weather (or hot if you live in the desert) and brightly colored blossoms. While I usually enjoy the view of my summer garden from the comfort of my air-conditioned house, this year I’ve experienced a twist in my summer gardening experience. I have spent time gardening this summer in an entirely different state. 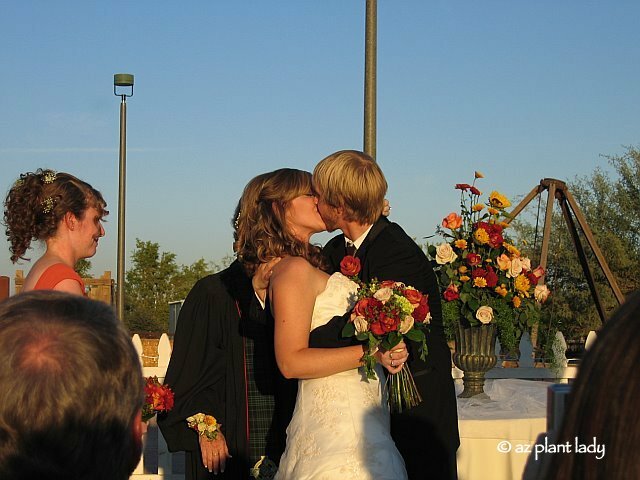 It all started back in 2007 when my daughter, Brittney, met a handsome geologist and got married. Fast forward to 2015 and that same geologist finished his Ph.D. and got a job offer in Michigan. So, they packed up and moved to the picturesque town of Petoskey, which is located at the ‘top of the mitt’ as Michiganders like to say. In June, they bought their first home, and I was on hand to help them with their new garden. Now, to be honest, my oldest daughter has never shown any particular interest in gardening to this point in her life, despite my best efforts. But, that was before she had her very own house and garden. These next few posts will highlight our garden adventures, including me learning some new things about gardening in a climate where temperatures dip to -20 degrees in winter. Planting roses for my daughter. Whether you live in the desert southwest, Michigan or anyplace where you have a small area in which to garden – many of the same gardening guidelines apply, and I invite you to join me on a summer gardening adventure where I promise, you’ll learn a few helpful tips for your garden. In today’s post, I’d like to share with you a very special day that we spent with our youngest daughter, Gracie. For those of you who have followed me for a while, you will have read about Gracie’s story and how we adopted her from China back in 2003. She was one and a half years old when she was adopted and had a sweet smile and a club foot. Gracie brought instant joy into our lives and despite having a clunky cast on her foot and leg as her foot was being straightened, she always had a smile ready for us. She rejoiced at belonging to a family for the very first time her short little life. 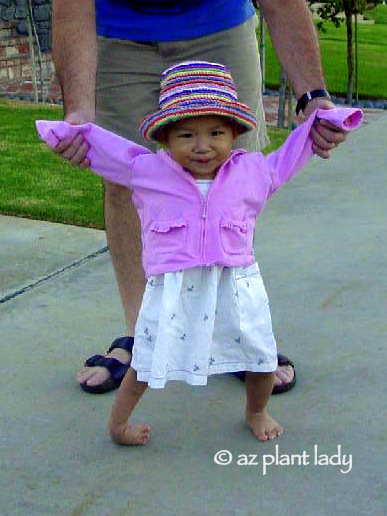 Three months after flying home from China, Gracie underwent surgery to repair her club foot. 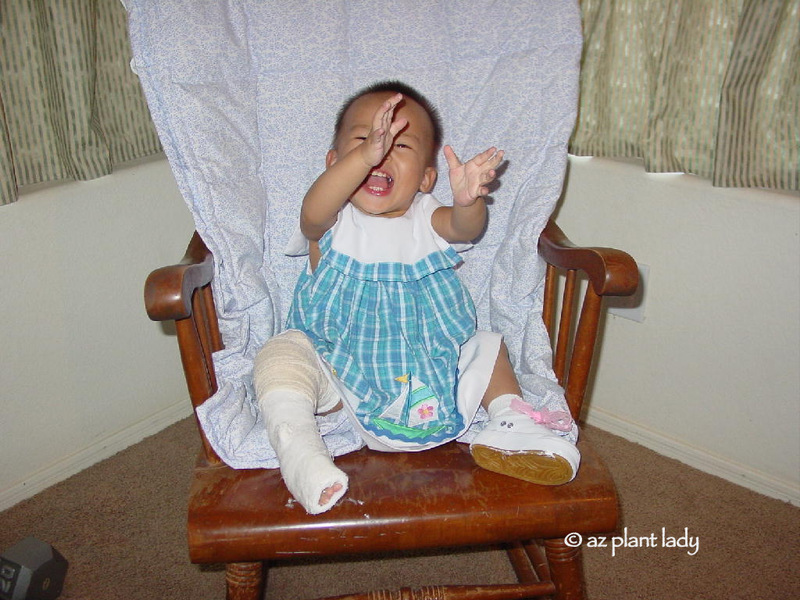 While her foot healed quickly, we soon came to realize that Gracie was suffering some delays in her development. At first, we thought it was from her time spent in an orphanage. However, later we learned that she had autism, or more specifically, Asperger’s, which is a high-functioning form of autism. Gracie is now 14 years old and as you can imagine, life hasn’t always been easy for Gracie (or us), but on most days, she brings us joy and a smile. This past weekend, we were able to take part in a special event in Gracie’s life. 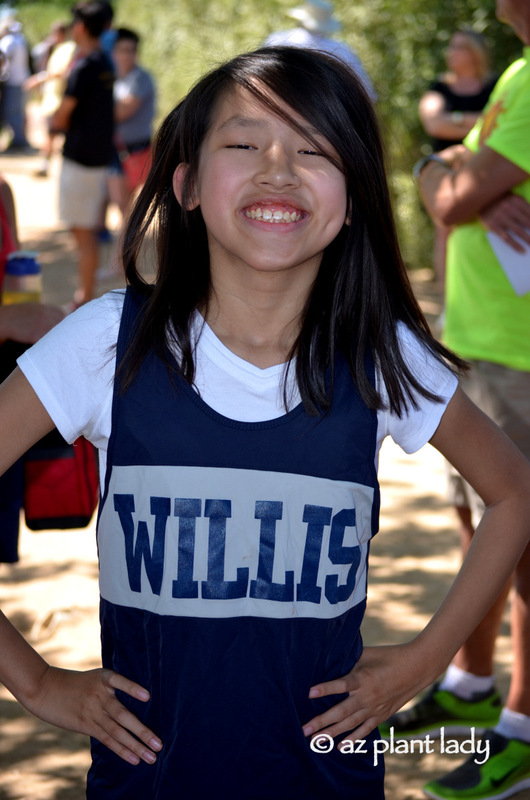 She was set to participate in a Special Olympics event representing her school. The day was set to be a hot one with record-breaking temperatures, but it was still lovely outside while sitting in the stands waiting for the events to begin. The kids were all gathered off to the side of the field, enjoying the shade of the trees while awaiting their turn. Gracie’s teachers were there along with other classmates who were to participate in the event. There were also ‘typical’ kids who were there representing their teams as well and we waited while they competed until it was time for the Special Olympics portion of the event to take place. Of course, waiting can also make you more nervous and Gracie wasn’t sure if she could do it. Her events were scheduled to be the 100-meter dash and the long jump. 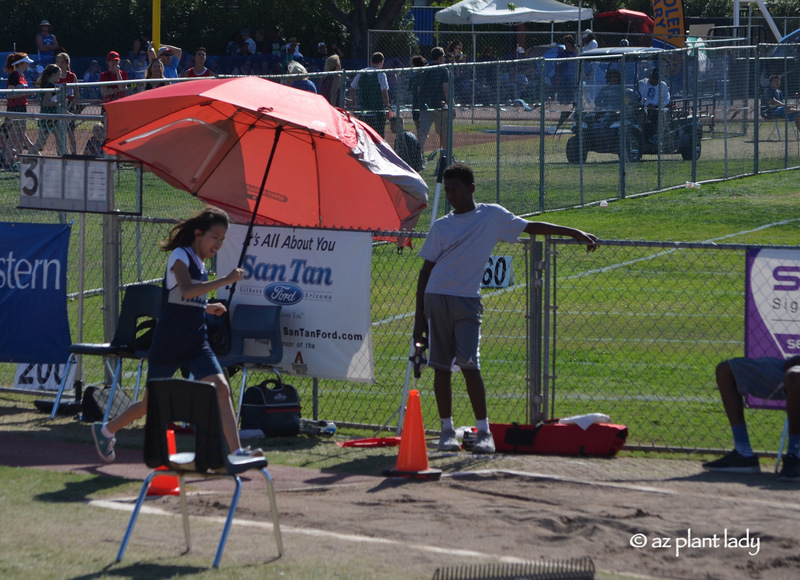 The problem was, she didn’t want to do the long jump. Those of you who are parents of teenagers know that it can be hard to reason with your teen, but when they have autism, it is even harder as the regular arguments and persuasions don’t work. 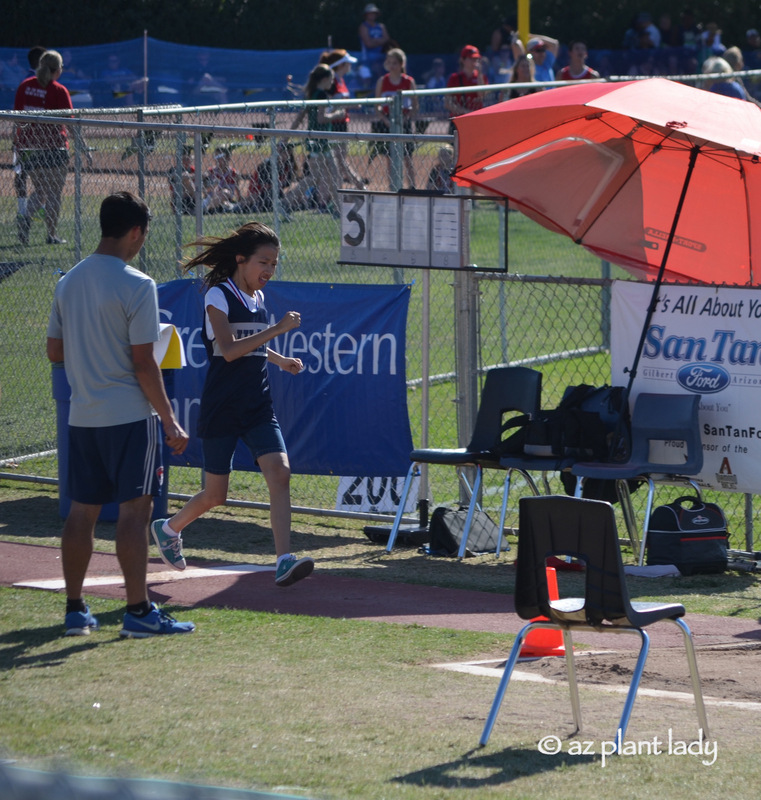 I wish that her dad and I could take credit for figuring out a way to inspire her to do the long jump but Gracie figured out a way for us to motivate her – promise to buy her a box of ‘Cookie Crisp’ cereal afterward. At this point, I should mention that we rarely give our kids what we call ‘sugar cereals’, which are filled with empty calories and don’t fill you up. 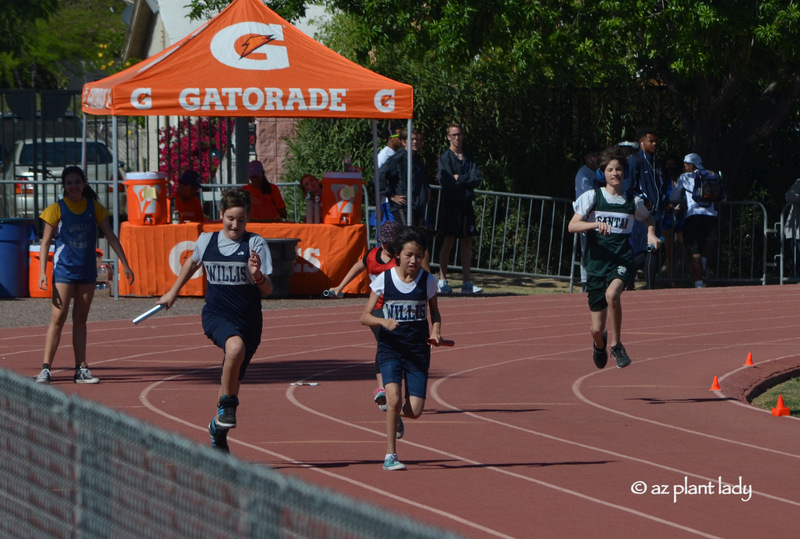 But, I happily promised to drive to the store and buy her a box right after the race if she was brave enough to do the long jump – her school team was depending on her. She also wanted a medal very badly. So, I said that if she didn’t get a medal, I would make her one, to which Gracie said, “But you’ll have to buy spray paint, a circle-piece of wood and ribbon.” At this point, I told her that I would be happy to make her the coolest medal I was capable of for her to wear. Our son, Kai, also came to cheer Gracie on. I love this photo that I was able to get of them – they rarely stand this close to teach other – ha, ha. 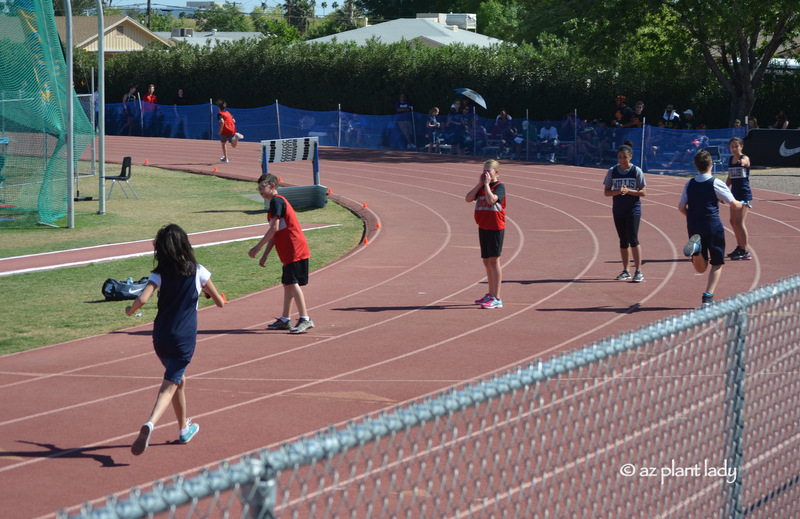 The first event that Gracie was to participate in wasn’t the 100-meter dash as previously scheduled. 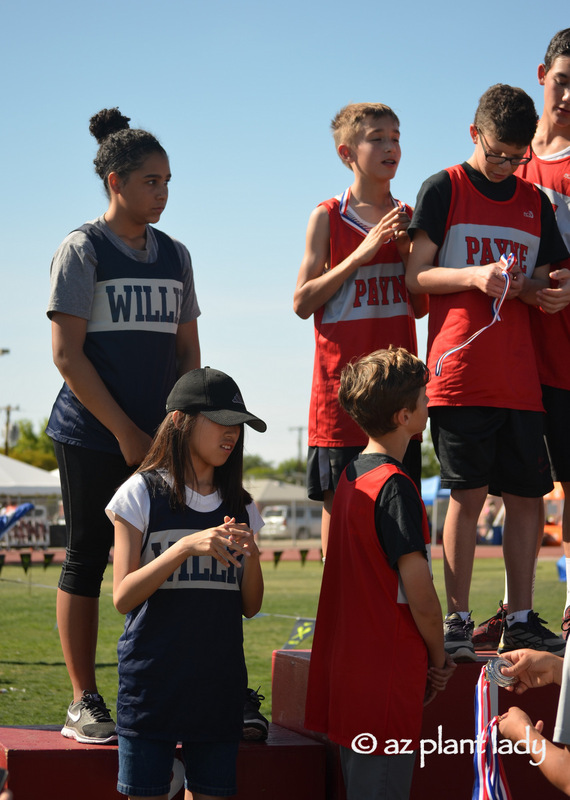 That event was cancelled and her team needed her to fill in the space of a missing team member for the 400-meter relay race. Since that would entail Gracie running 100-meters, that would work. 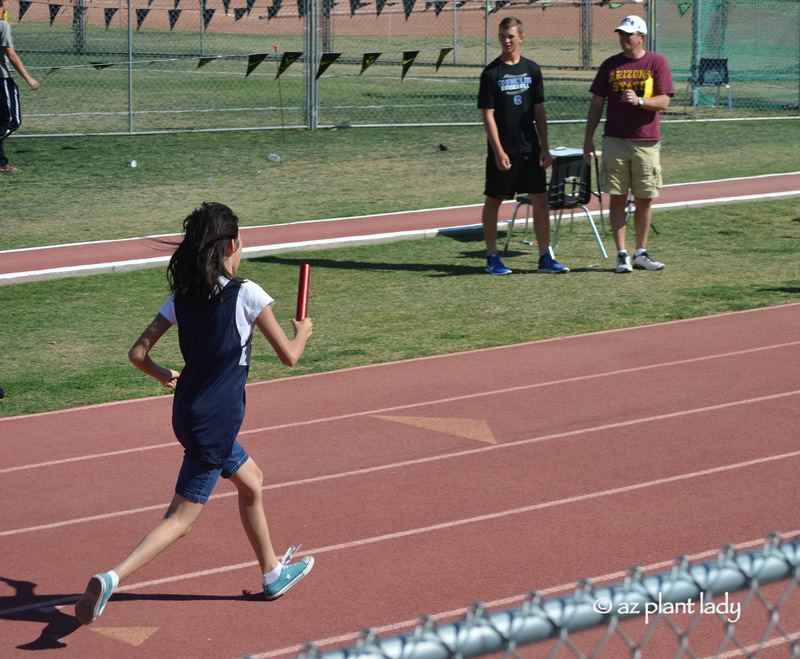 She was nervous about dropping the baton, but she grabbed it and began running. Almost ready for the hand-off! 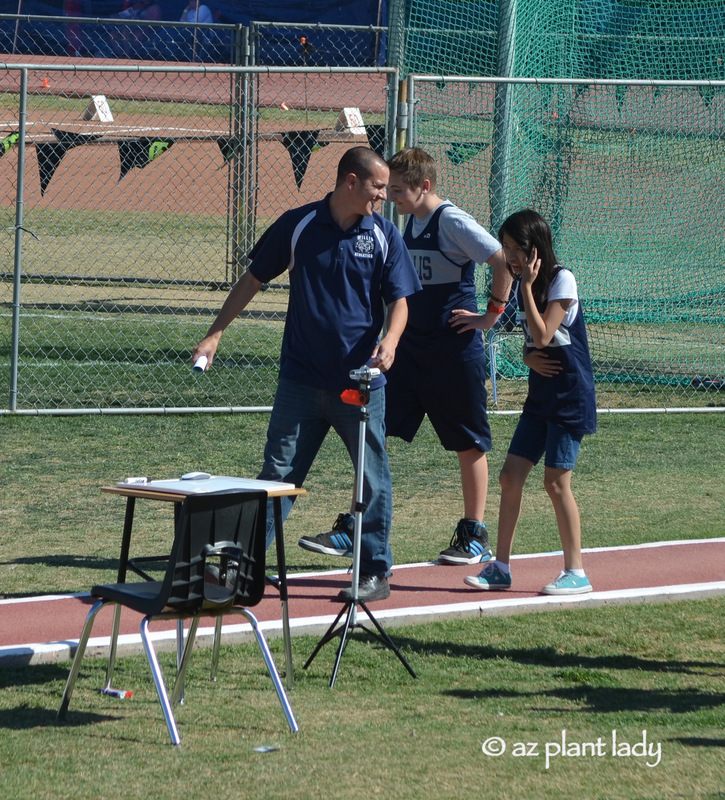 The hand-off went off without a hitch except that Gracie got a stomachache from all the excitement and running as she walked with her math teacher and coach to toward the rest of her team. After the race was over, the teams were asked to gather around the medal podium. 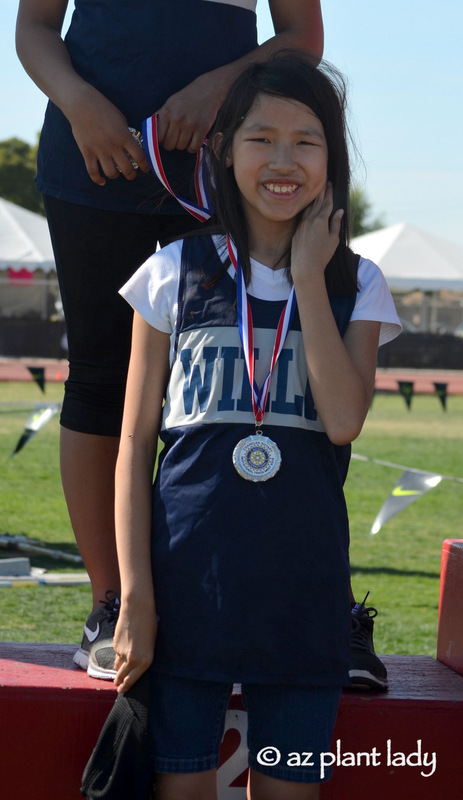 Guess who got a medal for helping her team come in second place? 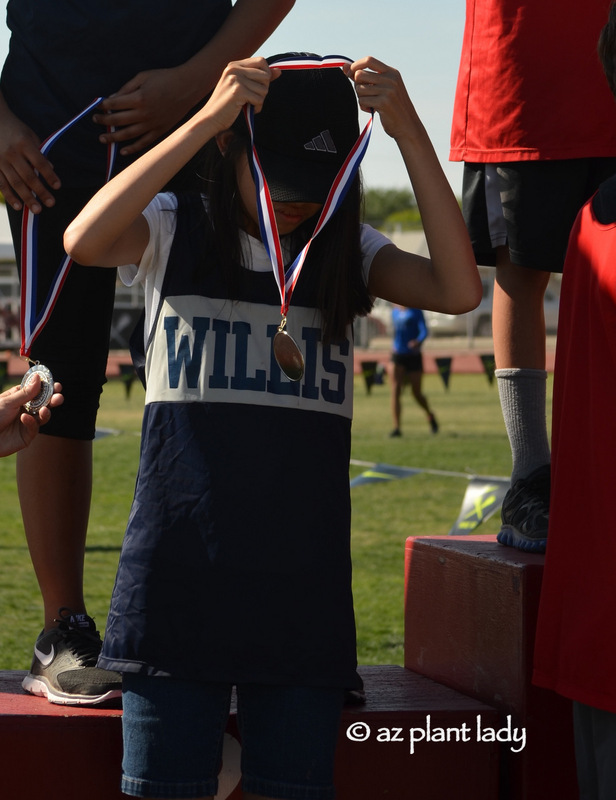 All the kids who participated in the Special Olympics relay race received medals, but Gracie’s team did get second place, which made her feel extra special. I guess I won’t have to make her a wooden medal now. 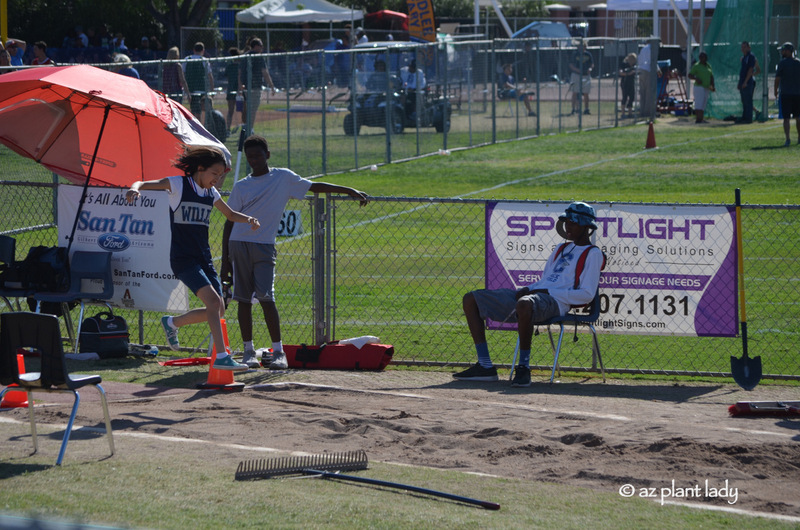 Next, it was off to the long jump, and hopefully, a box of ‘Cookie Crisp’ cereal afterward. Gracie waited patiently for her turn and then pumped her arms very fast (for extra energy, she said) before taking off running. This is Gracie’s favorite photo since it looks like she is flying. As you can see, this was a very memorable day for both Gracie and us. Being a teenager is hard enough without having autism. When you pair that with the challenges that they face everyday trying to fit into a world whose rules and social norms don’t make sense, then you get an idea of what a momentous occasion this was for her. Gracie wore her medal to church yesterday and it warmed my heart to see members of our congregation come up to hug and congratulate her. **Thank you for taking a few minutes out of your day to read Gracie’s story. It is an honor being her mom and sharing her story with you! 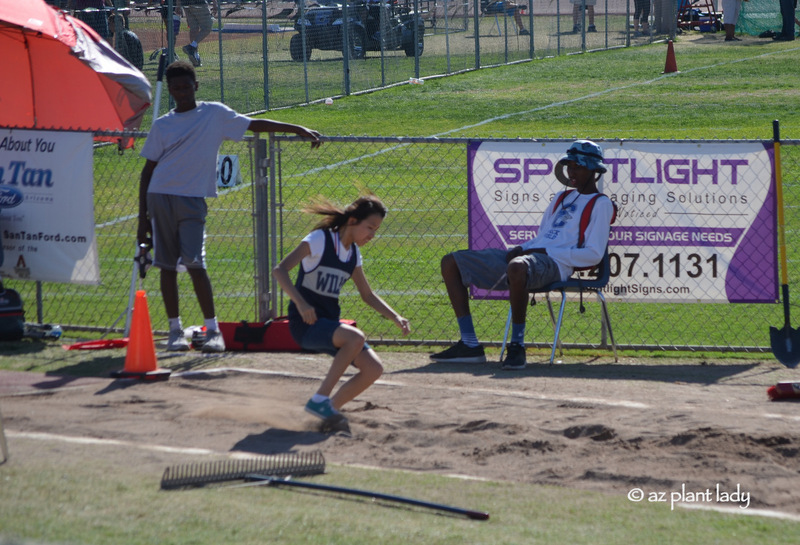 If you would like to see Gracie’s long jump video, I’ve posted it below. You can read Gracie’s adoption story, here. My passion is to teach people how to create beautiful outdoor spaces using plants that thrive in our arid climate. Part of that involves writing garden articles for a variety of publications, including Phoenix Home & Garden Magazine, Home Depot, Houzz, and Birds & Blooms Magazine. It’s hotter than he** (dare I use the word “hell”?) outside in June and while most desert dwellers can be found hibernating indoors enjoying air-conditioned temperatures in the 70’s – you’ll find a few of us darting outdoors to pick apples. While parts of the country wait until late summer and on into early fall to harvest apples – June is apple harvesting time in the desert. 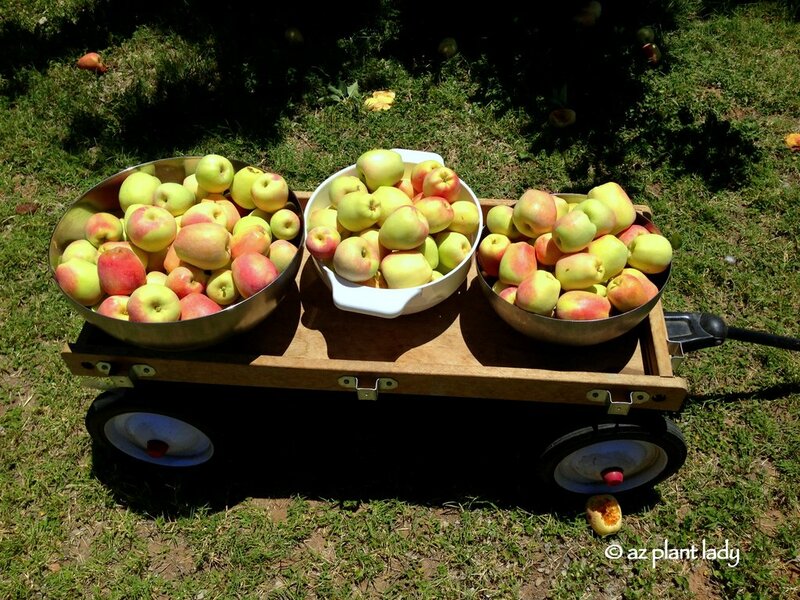 Many people don’t realize that apple trees can grow in the desert Southwest – so do apricots, peaches and plums. The key to growing these types of fruit trees is our relatively cold temperatures. They need a certain number of “chilling hours”, which are when temperatures are within 32 – 45 degrees F.
When summer temperatures are hovering in the 100+ range, it’s hard to recall what cold winter temperatures feel like, but it’s those chilly temps that make it possible to grow apple trees. 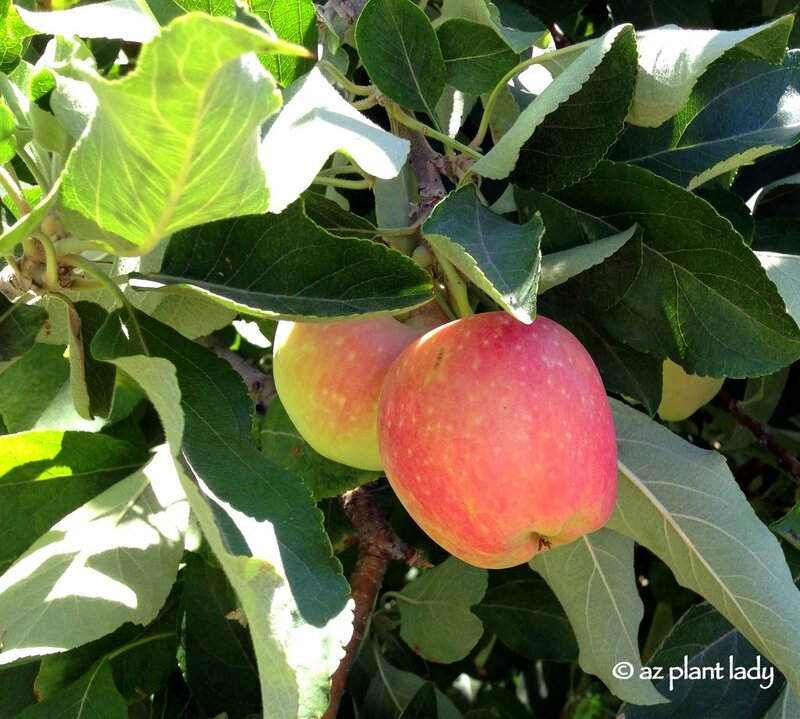 In the past years, I have harvested my apples from among the several apple trees located on the family farm. Three years ago, we transformed our side garden, creating a “potager”, which is a French term for a kitchen garden filled with fruits, herbs, vegetables alongside ornamental plants. In the potager, we have the largest of our vegetable gardens, blackberry bushes, two peach trees, an orange tree and two apple trees. The apple trees are located toward the end of the garden with the blackberry bushes growing against the wall. This was what they looked like 1 1/2 years ago. Since then, they have grown quickly and are filled with apples, ready for us to pick. Today, we will head out in the morning and pick our apples. There are so many growing, that I won’t need any from the family farm. Normally, I make applesauce and an apple pie from apples. This year, I will make those but will add to it. We will also be making apple chips and apple sugar. Who knows? If we get a ton of apples, I may need to find more things to make with them. 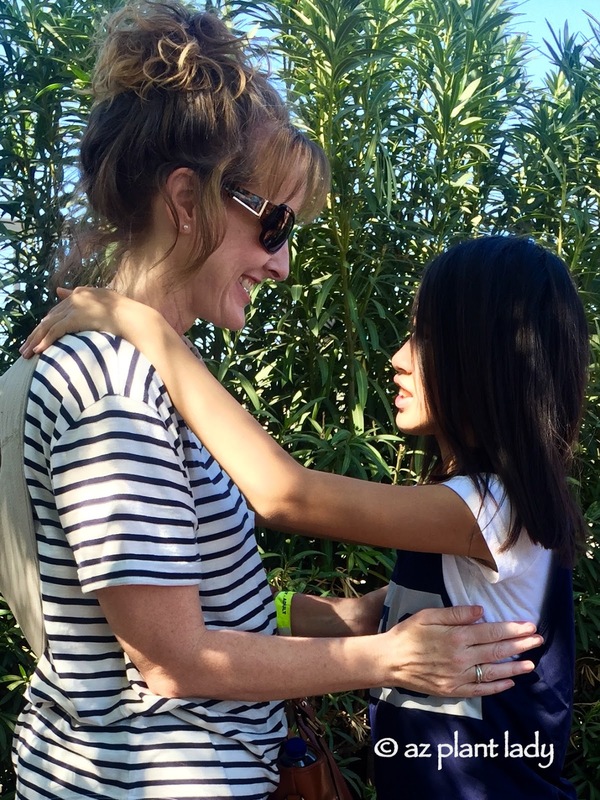 My daughter, Ruthie, and niece, Sofie, will help me along with a very special friend who is their “orphanage sister”. **Next time, I’ll share their special story along with all the goodies we make along with helpful links so you can make them yourself with apples from the supermarket.